“Well, why not?” I asked myself, and began pondering the joyful outcome that always arises from random acts of blessing. I’ve always wanted to be an extrovert — or at least an optimist. Failing at both, I’m thankful to be a Christian, for when Scripture presides over any natural tendencies I may have to hunker down and spend my whole life “ordering my private world,” I get to move outside my comfort zone and to make a commitment to be a blessing to others. The first chapter of Paul’s letter to the Ephesians is a challenge I return to again and again with its strings of dependent clauses and its long stretches between end punctuation. I may not have it memorized Navigator-style, but this one thing I know from my stumbling repetitions as I walk these country hills on the business end of a St. Bernard’s leash: God’s blessing (v. 3) and His choosing (v. 4), His acceptance (v. 6) and His redemption (v. 7) will result in an ultimate gathering (v. 10) of all believers and all things — in Him. Believers have been “blessed with every spiritual blessing in the heavenly places in Christ” so that we can be a blessing to others and add to the joy of that future gathering. 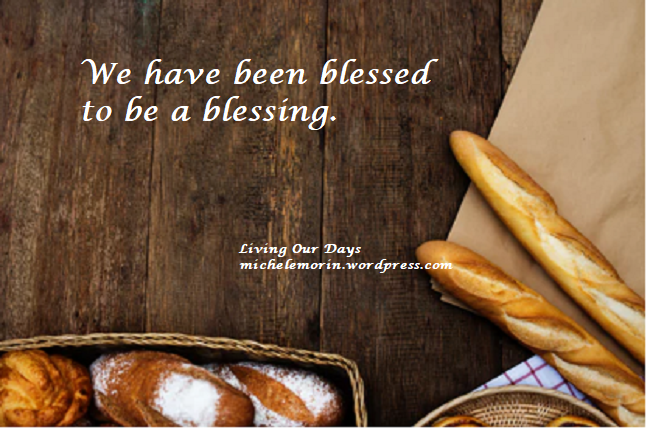 Having been blessed, I am called to be a blessing. Given that God, in His providential grace, has already heaped up blessing upon blessing, my church family has designated 2018 as our Year of Blessing. We’ll meet to feast and declare it to one another, we’ll invite others into the blessing, and, most of all, we want to be intentional about it. We’re used to showering people with food when they have a baby or if someone in the family is in the hospital, but what about someone who lives alone on a snowy day in January? If God brings someone to mind, there’s likely a reason for it that only He knows. How wonderful to be on God’s encouragement staff and to receive private memos from Him! My Blessing Mentor/Friend offered to be the liason for food delivery. And if our target audience has a freezer that is too small to accommodate the blessing, she has room in her freezer and will take care of the overflow in the meantime. If the project you have in mind is too big to do alone, ask for help. If you want to help, but don’t know what to do, make a friendly phone call or visit and be a good listener and observer. Recently, our women’s ministry experienced some setbacks in arranging the details for our Christmas project. Usually we bless a struggling family with children by purchasing gifts, but this year our contacts kept falling through, so we fell back, regrouped, and ended up blessing a recent widow with gifts and a visit for tea. She would never have come to mind if our business-as-usual plan had worked out, and in the process we were able to meet a need that others were not aware of. There’s really no way we would have known that this is exam week at our local high school, but a para-church ministry in the area knew and invited us to contribute snacks for the teachers during this challenging week. What practical ideas do you have for being a blessing to others in your church and community? Oh, how she had grown to hate him. Ten thousand offenses, both small and large, had accumulated over the years since their arranged marriage. Playing hostess to his drunken friends and enduring his loutish company, the loneliness was excruciating. Even so, she thanked Yahweh every day that there were, as yet, no children from this unfortunate match. “I am your servant,” she prayed each day at sunrise and found, over time, that the God of Israel had become her comfort in this desert-life. When hope for love has left a marriage, what remains?
. . . unless the rattling husk becomes a place for something new to grow. Slowly, Abigail began to notice the workings of Nabal’s household. Her quick mind took in the details of the livestock business, the buying and selling, the shearing and marketing of fine wool. She had long ago stopped hoping for love, but one day, she realized that the respect and confidence of the family servants had become her consolation, a gift from Yahweh. The season of shearing was upon them with its steady hum of activity, but Abigail welcomed the challenge and the stimulation, planning meals for the shearers, managing the bountiful output, and arranging for its transport. During a lull in the chaos, she was catching a breeze in the doorway when Othniel, her faithful steward, appeared, wild-eyed, breathing like a frightened creature. “What is it, Othniel?” she asked. Abigail dropped her face into her hands and listened, knowing that what followed could only be bad news. A refusal to provide reasonable compensation for services rendered. Perhaps it was not too late to undo The Fool’s damage. From shearing season’s full larder, Abigail rattled off a hurried and portable menu and directed Othniel to load it onto donkeys and to lead the way to David and his men. “I will follow close behind,” she assured him. Hurriedly, she changed out of her work clothes, mounted her own donkey, and followed. But suddenly there they were, rounding a corner with strapped-on swords like a military detachment – headed toward her home. David was in the lead, but he stopped in his tracks when Abigail dismounted and fell on her face at his feet. Abigail lifted her eyes in time to see surprise register on David’s tanned face. “Therefore, I have brought the feast to you.” She gestured toward the loaded caravan. Was it just her imagination, or did David’s eyes move reluctantly away from hers? “Please do not let your name be associated with revenge and bloodshed, but accept these gifts. Because you have fought Yahweh’s battles, He will wrap up your life with His treasure and will certainly make for you an enduring kingdom. He will cast aside your enemies like a stone hurled from a sling. When Yahweh has brought these words to pass, remember me His servant. Then, tearing her gaze from his, she turned to leave. With one hand, David stopped her, for the other hand was raised in blessing – a blessing over Abigail. “Blessed is your advice, your good sense. Blessed are you for keeping me from murder, for looking out for my reputation. Not since coming to the House of Nabal had she heard such words, and they carried her into the house. They sustained her through the night as The Fool slept off his evening’s wine. Describing David’s promise of revenge and her own actions, Abigail was startled to hear choking sounds from Nabal’s throat, but she continued with her report until a thud and sounds of alarm from the servants caused her to her lift her eyes. There lay The Fool, on the floor. The ten days between his fall and his death passed quietly, and Abigail wondered how the demise of her own husband could affect her so slightly. She had been aware of the shriveled condition of her heart, but marveled at the cool poise with which she had wrapped up the end of shearing season and notified Nabal’s near kinsmen. They would be arriving soon to take over his property. And what was to become of his widow? The memory of David’s blessing fanned a small hope that perhaps one day she would find a place of love and respect, but she did not know how that could be. She only knew that she must flee before The Fool’s family arrived and engulfed her as if she, too, were a possession. Gathering a small packet of provisions, she made ready to depart. Hearing footsteps, she whirled, ready to bolt from the room, but instead she froze. And such is the glory of unexpected love. and trusting for a better future. Be sure to check out the context for this Old Testament love story! And any of these could be the mission statement for David “JB” Miller or for the Life Letter Cafe, the on-line ministry he has founded based on the truth that God chooses to invest deeply into the lives of those who pour themselves into others. With 200+ bloggers sharing their work at The Cafe, it has become a well-spring of encouragement for readers, and, as one of the bloggers, I can say with certainty that Life Letter Cafe also encourages the writers who share their words in that friendly space. Genesis and the Song of Solomon both speak of food that provides refreshment. In Psalm 68:9, rain refreshes a weary land. Proverbs 3:22 and 25:13 declare that wisdom, discretion, and a trustworthy messenger refresh like snow in the summer or like jewels on a necklace. Then, in the New Testament, Peter the faithful messenger and carrier of wisdom to the recipients of his second letter reminds his readers that he is trying to refresh their memory and to stimulate wholesome thinking. 3. Offer several new services and leverage increased influence for the purpose of contributing financially to the rescue of the unborn. David and his team are still in the early stages of planning and praying their way through this process. You can read more detail about the project here or explore the SmashFund crowd funding tool that is just now getting underway. And while you’re busy pondering all this goodness, how is your soul being refreshed these days? Have you passed the refreshment along to another? Knowing that Rosalie is facing some health challenges, she and her verse have been on my mind lately, and since I’ve been reading in I Corinthians 15 for the past three weeks, this was the perfect time for me to visit Biblegateway.com for resources that deepen my insight into Rosalie’s verse. Steadfast, immovable, and abounding are not words that most of us use in everyday speaking, so I was surprised to note how many of the newer translations have stuck with them. You can check for yourself by clicking on the I Corinthians 15:58 in all English translations link below the verse. The Good News Translation used firm and steady for steadfast and immovable, while the International Children’s Bible spoke of being steady and strong. This rendering of the verse anchors it deeply in the big picture of the chapter’s theme: Resurrection. A click on the four brown parallel lines beside the reference allowed me to view the entire chapter as needed, for I Corinthians 15 provides the most thorough teaching of any chapter in the Bible on resurrection and the Christian life. Paul is not offering an empty or theoretical hope. His admonition toward a steadfast and immovable perseverance on the narrow path — even when it feels as if the narrow path may be squeezing the life out of you — is not just a happy thought to keep us company as we endure. It is a promise of future life that has been verified by the resurrection of God the Son. Jesus was the “first fruits” of that promise, and based on that, we know that God can deliver the goods. Resurrection is the bass note that thrums underneath every word that Paul has written in this long and theologically rich chapter, for the truth of resurrection is the basis of a living, breathing, get-up-in-the-morning-and-obey-God-all-day kind of faith. It is only because God keeps showing up with power that I can war against sin — every day. He offers freedom from slavery to other people’s approval and from my stubborn need to be “right.” He brings life to this new creation so that I can find grace to hate the selfishness and small-living that would keep me at the center of my own universe. Rosalie Ranquist and the truth of her favorite verse serve as a continual reminder to me that nothing is wasted in God’s economy: our suffering and our service are all infused with meaning because we live in a hope that is based on Truth. Check out the resources at Biblegateway.com by using it to enhance your understanding of a passage that you are studying today! Weekly we gather — seldom daily as they did in New Testament times, the era of ravenous lions and Nero’s flaming, pitch-dipped Christians, human torches to light his gardens. Lugging our three pound Bibles and a week’s worth of accumulated angst, we gather, having in common our hearts of flesh and likely the scar tissue where hearts of stone rubbed us raw in time past. According to John MacArthur, Paul’s account of Jesus’ last Passover celebration in the Upper Room pre-dates the Gospels, making it the first written record of the event from which we pattern our modern day communion service. Paul received the story that the eye-witnesses would write about later. Let that sink in for a moment: post-crucifixion, post-resurrection, post-ascension, Paul was given the privilege of writing about an event he would never have been invited to at the time. The bread and the cup had once been the centerpiece of the early church’s coming together. However, in keeping with human nature, it had become a hollow shell. Indifferent, ritualistic, unrepentant, and greedy, the Corinthians gobbled bread and slurped wine without a thought for Christ’s sacrifice. It was Paul’s intent to fill that tradition with meaning once again. Can we say that what happens when we “come together” each week is “for the better” — for the enhancement, the building up of the Body? Oh, we will not do it perfectly. Not now. Not on this planet. But do we listen more than we speak? Do we ask questions like a bridge from heart to heart — and then really pay attention to the answers that travel back to us on that bridge? Can we bear in mind that the point of our gathering has very little to do with order of service or music style or whose turn it is to serve in the nursery? Whatever our tradition — bread cubes and grape juice, matzo and wine, daily, weekly, or monthly — when we gather “for the better,” we receive the story anew. We lift up the Gospel of Truth and put the wonder of incarnation on display, demonstrating that we are committed to a Kingdom that is both already and not-yet. Here in New England, church attendance is no longer a cultural norm. Unbelievers (and even some Christians) have accounted for the church in the column labeled “irrelevant,” but — whether by curiosity or by compulsion — if an unbeliever enters our fellowship, what would be his impression of our “coming together?” It’s no surprise that Paul had thoughts on this. His goal was that an “outsider” be convicted, called to account, and overcome by the reality of God’s presence. If awe is a contagious condition, is anyone who wanders into my fellowship at risk? Are the bread and the cup, the ministry of the Word, the lifting of voices, and the offering of gifts an empty tradition, a hollow shell — or does grace flow like wine? Knocking twenty-two years’ worth of dust off a resume stretches the definition of “creative writing” to its limit. After giving my time away for two decades, can I convince even myself that my skills are marketable? Am I still capable of holding my own in the workforce? The questions hang in the air like a challenge. This job search is not happening at all the way I had planned it. Certainly, I have always expected to return to work someday, but only after the graduation party for boy number four, the culmination of my career as a homeschooling mum. Naturally, I would observe a few weeks’ intermission — to beautify my future Pinterest-perfect home. Then and only then would I break out the resume and step magically into the job of my dreams – or else . . . just crank out a run-away best-seller, the smoke rolling off my keyboard from the intensity of its truth-telling. However, with reality comes the quaint truth that “making ends meet” may simply mean bringing them into the same zip code. With my teacher-husband home for the summer, why not let him manage the family mowing business – and the family? Why not see if I can land a summer job? Naomi would agree, I think. Senior heroine from the book of Ruth, she encountered the unexpected when Bethlehem, “The House of Bread” was stripped by famine and left without a crumb. The journey to Moab with Elimelech and their two young sons would have been a desperate act, and it was followed by a decade of every imaginable kind of loss as, one by one, her men — her protectors — died. Even the comforting presence of devoted daughter-in-law Ruth could not dilute life’s acrid brew that transformed Naomi the Pleasant into Mara the Bitter, (Ruth 1:20, 21). Naomi’s jarring change of direction leaves me breathless. How does a woman ever absorb the loss of a husband and two sons? One thing she discovered (and that I am learning) is that God is the only One who is equipped to recognize a detour while it is happening. It is only from the vantage point of the rear view mirror that we mortals are able to verify the truth that, all along, God had in mind our best interest and the furthering of His Kingdom. With the sadness of mourning still roaring in her ears, Naomi could never have imagined that her slow trek back to Bethlehem would be a journey toward life and joy – and grandchildren! She could not have discerned that her time in Moab – temporary after all – would reap a bearer of strong genes for the making of the Messianic Line: King David’s great-grandmother, Ruth, the gleaner of barley who gathered grace as well. How delightful to think that if I can adjust the angle of all my concerns at this turn in the road (Can I still be the present kind of mum I long to be? Who will direct the church’s VBS? Will my blog disappear from the planet? ), if I can move the trajectory away from worry and toward petition, I will “slip into” prayer. While you’re waiting, let the memory of past deliverances teach you to hope against all hope in today’s uncertainty, knowing that with every unexpected bend in the road you are veering into the loving and wise sovereignty of God. *The phrase “serene Providence” is borrowed from Ralph Waldo Emerson’s oration on the death of Lincoln. The year is really no longer “new,” and the image I’ve chosen for this study is — thankfully and finally — out-of-date (although we did have snow flurries on Sunday morning), and so today we conclude our study of Hebrews with the rich content of chapter thirteen. For weeks, I’ve been planning and pondering how to tie up some of the major themes we’ve covered together. Another theme that I had planned to review in detail begins in Hebrews 6:12 with the encouragement to imitate the faith and patience of those who have inherited the promises. This theme is perpetuated in a huge way with chapter eleven’s table of contents of Old Testament saints, and now chapter thirteen urges readers to consider who else they might emulate. The message is, “Go find some heroes,” for this is the sort of hero worship in which the hero will deflect attention to where it belongs, heroes who motivate us to worship God. Is this a strange verse to focus on? Not if you remember that we said from the beginning that our study of Hebrews would increase our appreciation for the book of Leviticus! Apparently there was an unhelpful teaching at large that involved food — perhaps Jewish dietary restrictions were being taught as a path to righteousness? The author is not specific, but without a doubt, in our century there is no shortage of unprofitable thinking about food whether it’s excessive dieting, addictions of all sorts, and even obsessions over what goes (or doesn’t go) into our bodies — as if that could defile us more than our faithless words or ceaseless striving, (Matthew 15:11). Efficient idol-factories that they are, our hearts have even found ways of turning fasting and the Lord’s supper into something they were never intended to be, when the truth is: There is no food regimen that will fix your life! With both feet planted firmly in his understanding of the Old Testament, the author reaches back for truth from Leviticus 16 and the Day of Atonement. The offering for sin made on that all-important day was carried outside the camp — and burned. None of it was eaten. Hebrews 13:12 draws a dotted line all they way forward to the cross, where, outside the city gate the sin offering to end all sin offerings was offered, and the “food” upon which we all now are strengthened is grace. This truth unmasks the hollow place that sends me to the refrigerator (again?) between meals. Over-eating or boredom-snacking or stress-binges may be signs of a grace hunger that no food on this earth will satisfy. The drooping spirit that sends me to the third (or fourth?) cup of coffee just to put one foot in front of the other may be more than just fatigue, but rather a sign that strength of spirit is lacking. Where does this strength of spirit come from? According to Hebrews 13:9, it doesn’t come from food. It comes from grace. Is it possible to eat grace for breakfast? The only reliable resource for feeding the spirit is Christ. This final chapter of Hebrews points us to the altar which brings us the abiding presence of Christ who is “the same, yesterday, today, and forever.” It points us to “the outcome” of the conduct of those who have run and are running the race of faith ahead of us. Most of all, the book of Hebrews points us to faith, the power that fuels right conduct, the source of all true righteousness. Lord, sweep us into the river of Your grace that we may remember — and never forget — where the strength comes from that will keep our wandering hearts close to you. Thanks to all of you who have persevered in this journey through the Epistle to the Hebrews. I’ve appreciated your input and your encouragement!